Jumping over a bamboo gate in Aranayake one day, Damayanthi Godamulla, then a member of a social mobilization project made her way to the home of villager Punchi Appuhami. She was visiting households in Aranayake to promote broiler chicken farms among village folk as a means of livelihood.Damayanthi tried to convince the elderly villager who was in his 90’s of the importance of rearing chicken as a source of nutrition. But Punchi Appuhami was not so keen. “Owa Pawkara weda, Api kapu beepu de enna pennanna” (‘raising chicken for meat is sin, come I’ll show you what we eat’), he said. Leading Damayanthi to his backyard, he showed her the different kinds of ‘wel ala’ – tuber varieties known as yams – that were flourishing there with little attention. 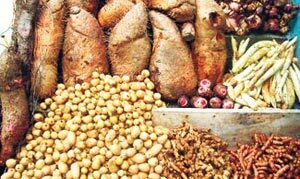 There were 17 different varieties of yams in his garden and Punchi Appuhami described their nutritional and medicinal values, surprising Damayanthi with his knowledge. Coming from the similar community, Damayanthi immediately realized the potential of these yams to address the nutritional deficiencies of the village folk. During the rest of her social mobilization project she identified other senior villagers like Punchi Appuhami who were still engaged in cultivating traditional roots and tubers. She noticed that among the younger generation, there was little attention paid to these and some varieties were becoming rarer to find. The diversity of the yam varieties was clearly diminishing. It was against this backdrop, that Damayanthi had later come across a notice on funding opportunities for Biodiversity Projects by the Small Grants programme under UNDP’s Global Environment Facility (GEF). She made a quick project proposal through the Community Development Centre (CDC) she had set up in 1996 to support her own community. Sri Lanka is a country rich in plant diversity, with a considerable number of edible and non-edible roots and tuber varieties commonly known as ‘yams’ with both indigenous and introduced roots and tuber varieties. The traditional knowledge of the value of these yams is passed on from generation to generation. But with urbanization, this is increasingly being lost and CDC’s project proposal had practical ways to promote the cultivation of yams and hence ensure their conservation. Seeing the potential of the project the UNDP decided to fund it. This small idea by villagers in Aranayaka has been hailed as an inspiration globally. The roots and tubers conservation programme of the CDC was selected as one of the 25 outstanding winners of the ‘Equator Prize 2008’, bagging its top award. The Sri Lankan project beat other biodiversity programmes in the world demonstrating outstanding work in poverty reduction through the conservation and sustainable use of biodiversity. Damayanthi and her colleague Nimal Hewanila, will now present this project as a world success story in preserving biodiversity at the UN Biodiversity Conference in Nagoya this week. “We are happy that we get a chance to make Sri Lanka’s name heard in the international conservation arena,” said Damayanthi. “It wasn’t easy in the initial stages,” recalls Damayanthi, a CDC directress. Information about yams was traditional knowledge which was communicated from generation to generation by word of mouth and there were no written sources to draw from. The project team started gathering knowledge about the yam varieties from older villagers. “We were amazed by their knowledge. They knew the benefits of different yam varieties which were passed to them by their elders.” For example, the yam known as ‘Hulankeeriya’ is good for stomach ailments; ‘Sewala ala’ is given for pregnant mothers; ‘Kidaram ala’ is good for haemorrhoids; and many other varieties are famous for their high nutritional values. After collecting the traditional knowledge, the team looked at how to promote cultivation in village gardens. A common problem was the wild boar that has a big appetite for yams. The solution came from the community – to fence off the cultivation areas. Astrological practices were used in setting up these protective fences around the cultivated areas. Villagers believed that would help discourage pest attacks and the CDC too had promoted these traditional customs which built the confidence of the village folk. One hundred households from ten villages in the Aranayake area were selected for the initial stage of the project. Yams require little attention after planting. The project started with 30 varieties. 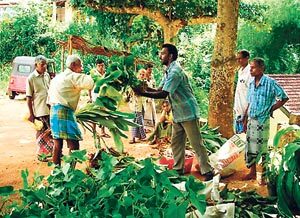 Some varieties were not commercially viable, but after they heard of their qualities, villagers happily started giving them space in their gardens. The yam project became a success and has now expanded to some 18 villages with the benefits reaching more than 2,000 people. CDC also works in five villages in Dikwella DS division in the Matara district. The villagers are selling the yams, earning a considerable income now. The team that has identified about 60 varieties of traditional yams are taking measures to conserve them. All these root and tuber plants have unique characteristics including disease resistance and the ability to flourish in less fertile soils. Most of these roots and tubers also have medicinal values and qualities which were identified from time immemorial and passed from generation to generation. “So these indigenous yams should be considered a huge genetic treasure trove,” Nimal Hewanila, a board member of CDC commented. Traditional knowledge of these varieties also would help in research, and protecting the indigenous yam varieties would help to protect genetic diversity. The Aranayake community network has also diversified into other traditional food varieties. The Green Leaves project is another such initiative they have begun. “There are about 125 edible green leaves in the country which have different qualities,” Hewanila said. We worry about the price of bread, but yams are a good alternative. “Yam is the bread of our ancestors, so why not return to it?” asks Damayanthi. Although these traditional roots and tubers were consumed in the past, their role has declined in the recent times. This was a result of the increased cultivation of modern ‘developed’ crop varieties; increased consumption of potatoes and bread consumption, the CDC report states. Yams can be grown even in small gardens. Different varieties can be harvested at different time durations, so you can plant varieties to get food throughout the year, says Damayanthi. “You can cultivate different varieties getting harvests spread across 12 months,” she says. They don’t need any special attention and at least 10 varieties can be planted in a mere 5 perch plot, she says, urging that they be grown in your backyard. This entry was posted on October 19, 2010 at 01:30 and is filed under 2010: Year of Biodiversity, Biodiversity, cop10, Flora. You can follow any responses to this entry through the RSS 2.0 feed. You can leave a response, or trackback from your own site.